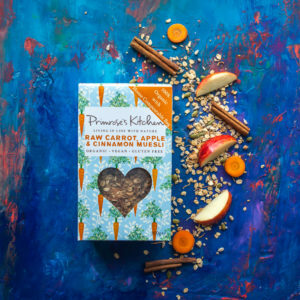 Care for the environment has always been a core principle of the Primrose’s Kitchen brand, and the company is excited to announce the launch of its new, environmentally-friendly packaging. 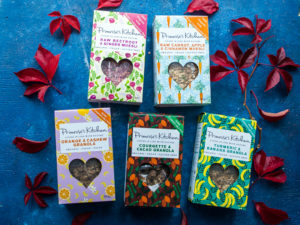 As of September 2018, the full range of Primrose’s Kitchen Muesli, Granola and Porridge will be packaged in home compostable bags, with a recycled/recyclable cardboard box. This is step towards sustainability has been a work in progress for some time, the main aim to reduce the impact on the environment by Primrose’s Kitchen and its customers. The fully-compostable bags are Vincotte certified and can be added to home compost bins, or to food waste bins, making Primrose’s Kitchen the first cereal brand in the UK to offer such packaging. The height of the cardboard box packaging has also been reduced by 17%, resulting in less material usage – the weight of box will of course remain the same! As well as these changes to packaging, Primrose’s Kitchen is also proud to announce that all its products are now 100% organic. As a small business the move to 100% organic has taken some time, but founder Primrose Matheson believes it is a very important step to have made. As a brand, Primrose’s Kitchen strongly believes in the importance of reducing our impact on the environment, reducing plastic usage and material waste. 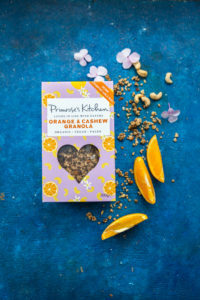 The change in materials for Primrose’s Kitchen is a small but significant step towards a healthier planet and a move that all companies should look to embark on.